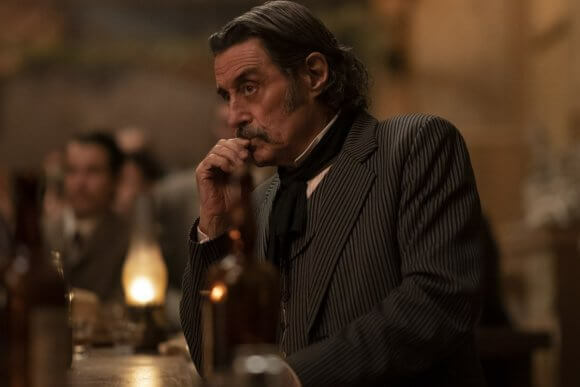 That scream you heard on March 21, 2019 at around 2pm ET was thousands of Deadwood fans reacting to the release of Deadwood: The Movie‘s first trailer. HBO unveiled the one-minute teaser along with announcing the much-anticipated film will debut on Friday, May 31st at 8pm ET/PT. The trailer opens with a voice-over by Ian McShane. “This town is a sanctuary. Every man worth the name knows the value of being unreachable,” says McShane, reprising his role as fan-favorite Al Swearengen. The teaser goes on to show a few clips of the rest of the returning cast, without giving away too much of the actual plot. In addition to Ian McShane, returning cast members include Timothy Olyphant as Seth Bullock, Molly Parker as Alma Ellsworth, and Paula Malcomson as Trixie. Also returning are John Hawkes playing Sol Star, Anna Gunn as Martha Bullock, Dayton Callie as Charlie Utter, Brad Dourif as Doc Cochran, Robin Weigert as “Calamity” Jane Canary, William Sanderson as E.B. Farnum, Kim Dickens as Joanie Stubbs, and Gerald McRaney as George Hearst. Sean Bridgers is back as Johnny Burns, W. Earl Brown returns as Dan Dority, and Keone Young reprises his role as Mr. Wu. Jade Pettyjohn joins the Deadwood family as Caroline. Series creator David Milch executive produces along with Carolyn Strauss, Daniel Minahan, Gregg Fienberg, Scott Stephens, Ian McShane and Timothy Olyphant. Milch wrote the script and Daniel Minahan (Deadwood, True Blood, Game of Thrones) directed the HBO Films original movie.